Striped dress: Forever 21. Cross-body purse: Forever 21. Beaded sandals: Minnetonka. Bracelet: gifted. Rings: H&M and vintage. Well, I'm officially aboard the stripes train. I couldn't pass up this cute, casual number! I liked that it was a summery dress, but not necessarily a sundress, you know? Now that I'm seeing it in photos I'm realizing this may not be my most flattering dress, but I do still love the bold stripes! I also am finding that because of the two dominant stripe colors & wide, simple pattern, that this is the perfect outfit to throw in accent colors and patterns with. I've done this with a little striped cross-body bag, Navajo-inspired sandals, and fun rings. I also started my summer internship this week! Besides the tremendous amount of information & skills I'm having to pick up in a quick manner, I really like everyone I work with and love having my own desk, company email address and extension (I'm finally feeling a little bit more like a grown-up haha). Since it's a casual office, I think this dress will be a perfect little number to wear into my internship! Congrats on the internship lovely. 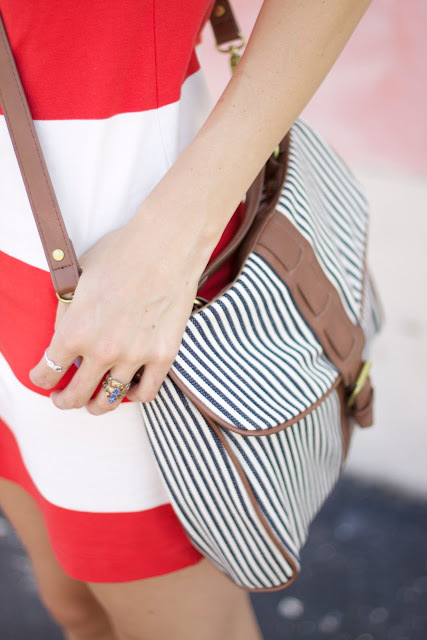 I'm loving this nautical-esque outfit, red is such an amazing colour on you! That dress is simple yet so stylish!! Hooray for your internships! They are so fun :) Enjoy it! You look soooo lovely and your outfits are great too!Nice blog! Lovely dress! And your blog header is amazing, you look so beautiful! ...and maybe we can follow each others, let me know if you! Wooowwww...I like this dress...it's fantastic! You are so beautiful! WOW you have such a beautiful blog and a great sense of style! I absolutely love it :) Would you like to follow each other? We are now your new followers! You look amazing as always :). I love the bold red stripes, they're different and simple. Also, that's so exciting that you found something for your internship... I'll be starting mine in a week and have learned I have absolutely nothing to wear! The striped knit dress looks lovely on you. I also have the crossbody double strap version. I love it! Your photos are beautiful! I love your sandals :) , and the whole outfit is pretty cool for this summer :) !! really loving the strips! they look great! This dress is adorable. I love it! Love this look! So nautica yet not all blue. cute bag! Love this outfit. Love everything stripped, it all looks amazing. I love your bag so much! Would you consider selling it?